Hundreds of thousands of people thronged the southern Indian city of Chennai on Tuesday to honor their late beloved leader, Jayaram Jayalalithaa, a former film actress and popular politician. Jayalalithaa, chief minister of Tamil Nadu state, died overnight following a heart attack a day earlier. 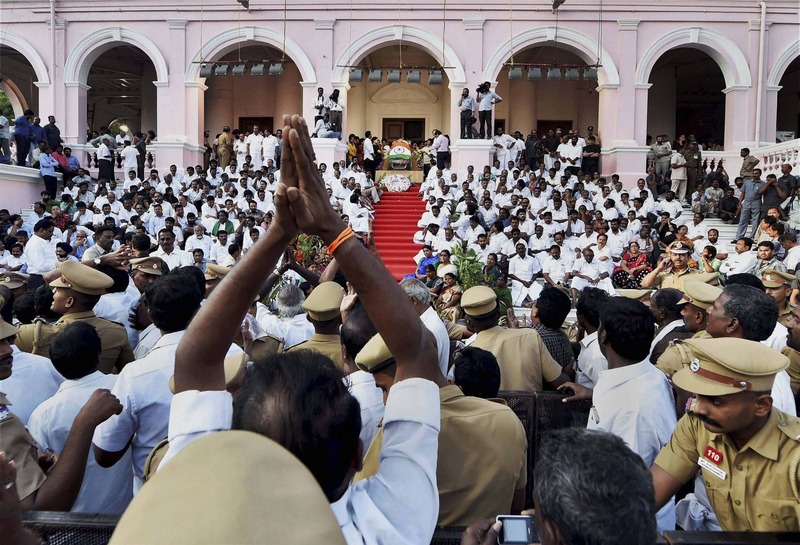 A sea of weeping mourners surged toward the steps of a public hall where Jayalalithaa's body, draped in the Indian flag, was kept on a raised platform. Thousands of police officers formed chains to stop the heaving crowd from surging up the steps. Men and women wept, some breaking into loud wails. Several mourners fainted from the heat and dehydration. 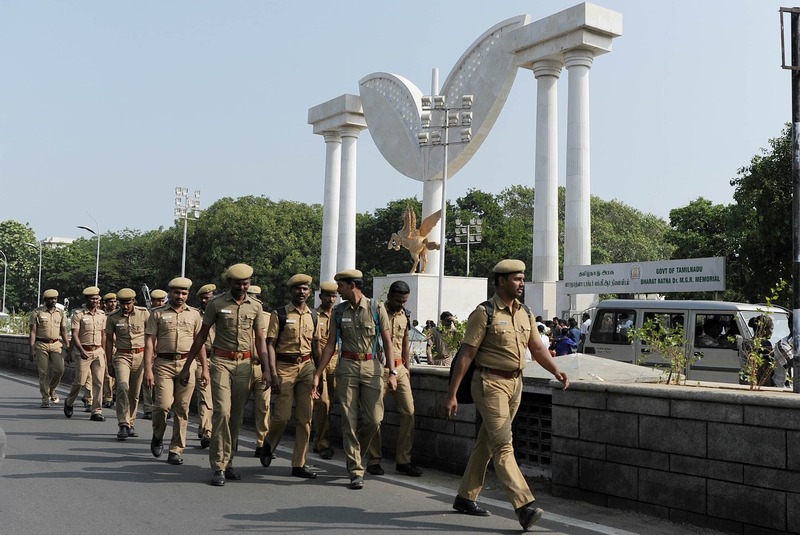 Police said some had been keeping vigil outside the Apollo Hospital since Sunday and then walked to Rajaji Hall at daybreak. In the evening, hundreds of thousands of people followed a slow-moving military truck carrying her body in a glass coffin to a beachside burial ground. In New Delhi, lawmakers observed a minute's silence Tuesday before both houses of Parliament were adjourned for the day in respect for the woman whom many referred to as "Amma," or mother. 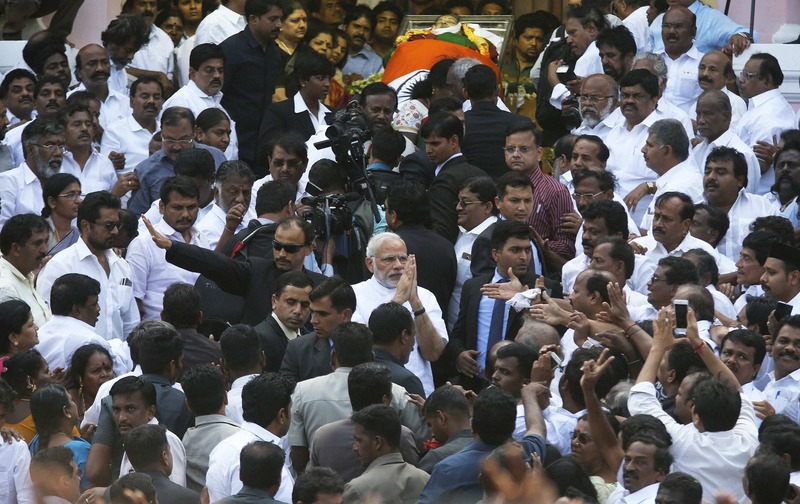 Prime Minister Narendra Modi said Jayalalithaa's death left a "huge void in Indian politics." He flew to Chennai, where he placed a wreath on the body. Roads leading to Chennai were clogged as people from remote villages poured into Tamil Nadu's capital to catch a last glimpse of their leader. The Tamil Nadu government declared seven days of mourning for Jayalalithaa, who was a five-time chief minister of the state. Schools and offices were closed after authorities declared public holidays in the state for three days. Within hours of Jayalalithaa's death, her trusted lieutenant, O. Panneerselvam, was sworn in as chief minister. Hundreds of political leaders and film celebrities traveled to Chennai to attend Jayalalithaa's funeral. Jayalalithaa, 68, had been hospitalized since September, suffering from a fever, dehydration and a respiratory infection. Jayalalithaa was 13 when she began her film career and quickly became known as a romantic lead in many of the nearly 150 Tamil-language movies she worked on. She entered politics in the early 1980s, under the guidance of Ramachandran, and after his death in 1987 declared herself his political heir and took control of the All India Anna Dravida Munnetra Kazhgam party. She served as Tamil Nadu's chief minister, the highest elected position in the state of 71 million people, for nearly 14 years beginning in 1991. She regained her office last year after a corruption case against her was overturned by a court. Jayalalithaa endeared herself to the poor and powerless with her policy of giving out handouts - laptop computers and bicycles to students, spice grinders, free rice and subsidized food to the poor, cows and goats to farm women - enabling them to rise out of rural poverty. She pushed government officials and workers to promote health and education by presenting gold coins and awards to those who exceeded their goals. Although she was criticized by many who equated her handouts with bribery, she said it was her scheme to wipe out rural poverty. In return, she was loved by the poor who saw her as their charismatic benefactor. "She was their redeemer. 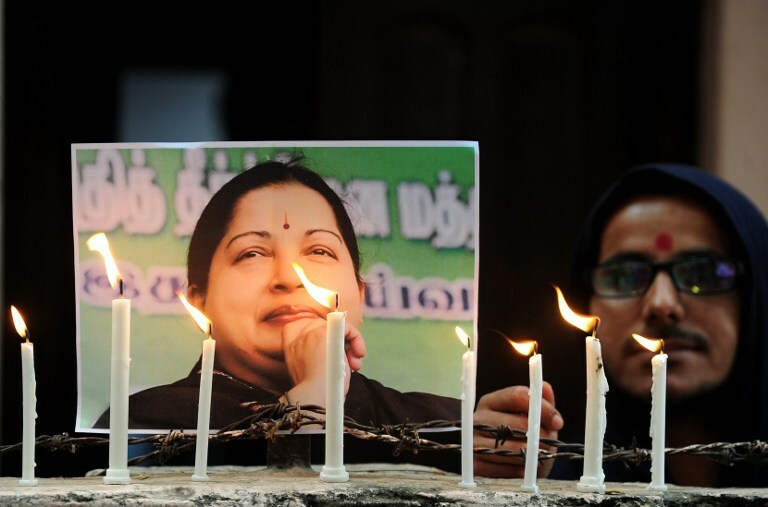 Their savior," Vasanthi, a well-known Tamil writer and Jayalalithaa's biographer, wrote in the Indian Express newspaper. Narendra Modi consoles Jayalalithaa's close aide Sasikala Natarajan as she mourns the leader's death. 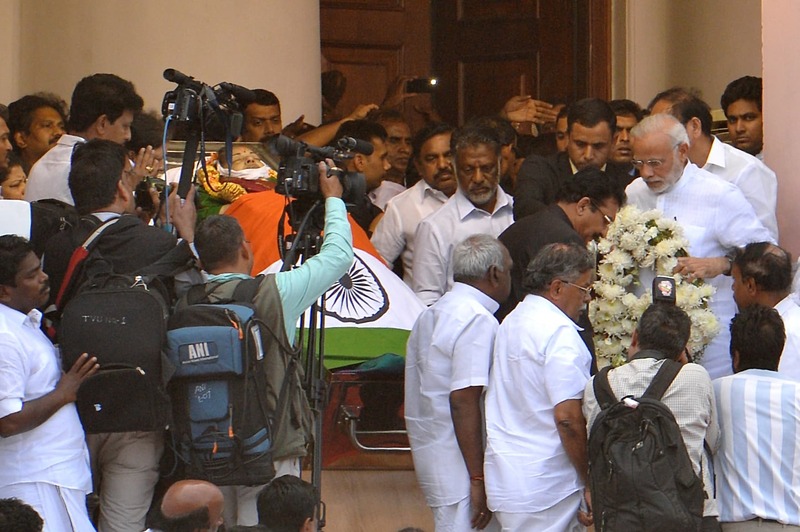 Prime Minister Narendra Modi pays his tribute to Jayalalithaa. 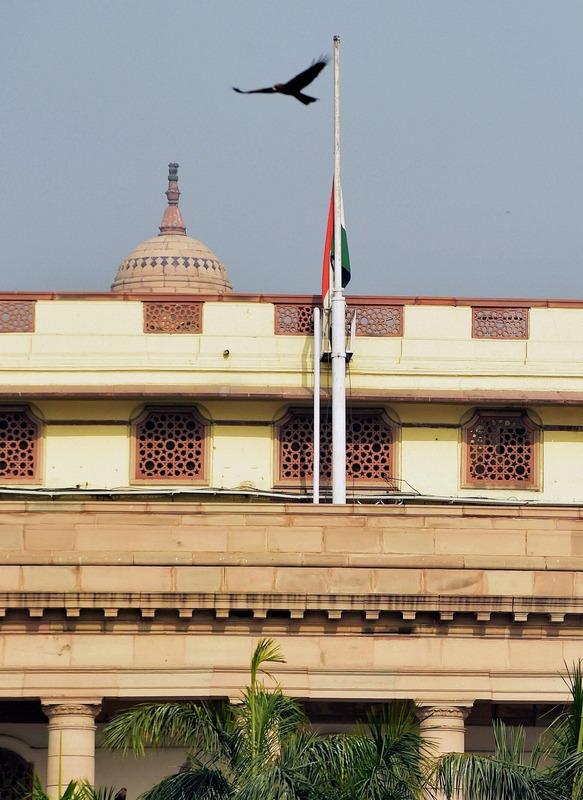 The Indian flag flies at half-mast. 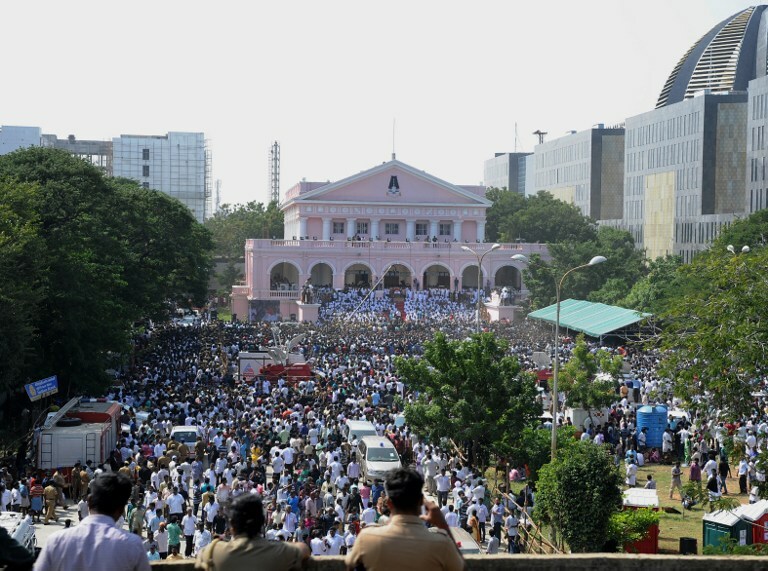 The crowd at Rajaji Hall in Chennai. Actor Rajinikanth at Rajaji Hall on Tuesday. 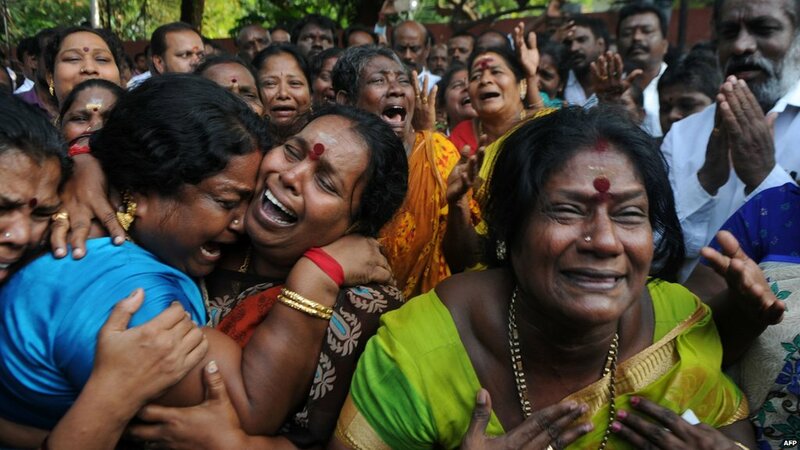 Supporters mourn Jayalalithaa's death in Chennai. 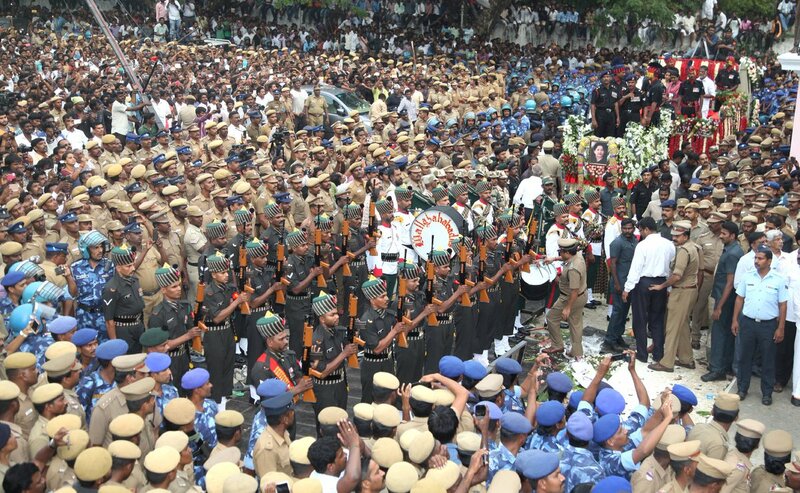 Thousands of supporters at Rajaji Hall, where Jayalalithaa's body was kept before her funeral. Supporters light candles in memory of the leader in Allahabad. 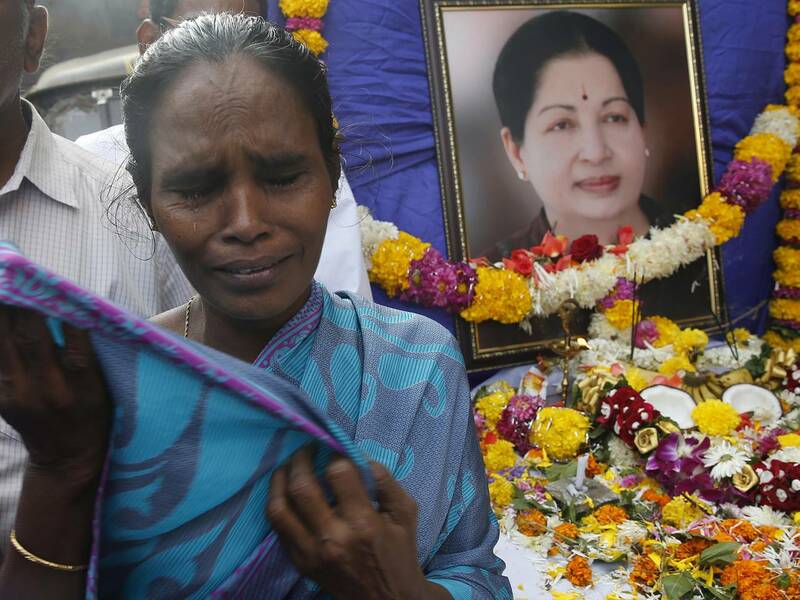 A supporter of India's Tamil Nadu state's former Chief Minister, Jayaram Jayalalithaa, mourns as she pays her tributes after her death outside their party office in Mumbai, India, Tuesday, Dec. 6, 2016. Jayalalithaa, the hugely popular south Indian actress who later turned to politics and became the highest elected official in the state of Tamil Nadu, died Monday. She was 68.